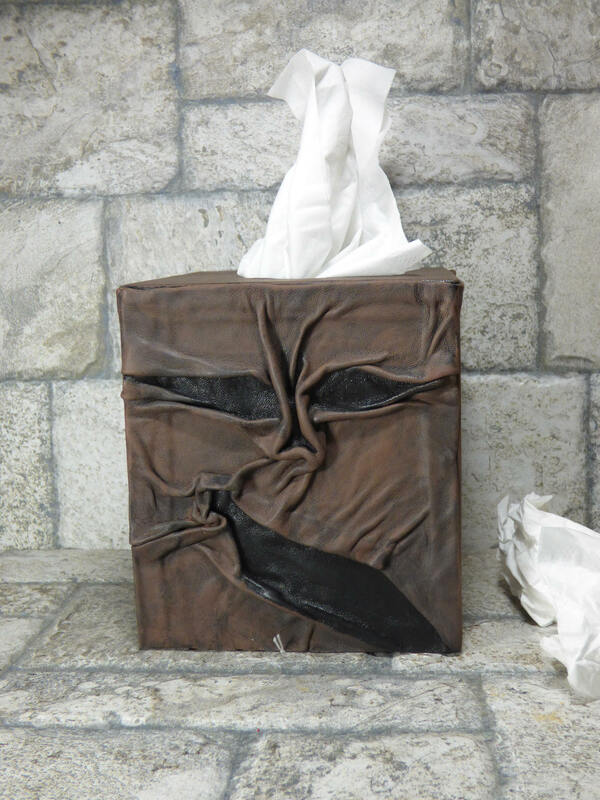 This wooden tissue box cover is covered with premium leather wrinkled and crinkled in all the right places. His evilness knows no bounds. The tissue holder is 5 1/2 inches (139.7 mm) across the front x 6 inches (152.4 mm) top to bottom x 5 1/2 inches (139.7 mm) front to back. It will fit the standard square tissue boxes and has a sliding cover on the bottom to hold the tissues in place if the box is moved. All my One of Kind original pieces are signed and numbered by...me, Pippenwyck!!! I hope you like these creatures!! There are many interesting things here so come visit often! You never know what you might find...Or what might find YOU!! This evil creature was found hiding under the cushions on my couch. During recent unpleasantness with the flu I took to my couch as a place of rest and refuge only to be tormented by this wicked creature! Filled with secrets and vile rituals it seemed his only thought was to bring me to the brink of insanity. Wickedness and vile construct was upon me! Finally, I had had enough! An ancient enchantment came to mind and now this heinous creature is a tissue box cover! Rather fitting if you ask me! His evilness has been contained, for now. Have you the tenacity to hold firm this creature forcing your will upon him to serve as keeper of the tissues? I pray you do! Good luck human!